Initially my plan for this blog post was to write up a short explanation of how to copy SQL Server instance master key between SQL Server instances, but too many people around me keep saying “start with why”, so I decided to go through some practical example from K2 world to illustrate when you may need to perform this operation. We will consider scenario of migration of already existing K2 database to a new SQL Server instance. This scenario will serve us as an illustration and essential “why part”. I also feel that it may facilitate understanding of the process itself. Let’s consider the following example. You just moved your K2 database to a new SQL Server instance, ensured that K2 service account has db_owner permissions on it (more information on required permissions can be found here) and trying to start K2 service. 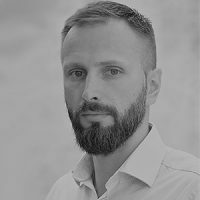 Assuming you are following the best practice of using SQL Server alias, accommodating this change from K2 side is a super easy thing: you just stop K2 service, edit your SQL alias adjusting Server name property using cliconfg.exe and start K2 service again to verify the results (no K2 reconfiguration whatsoever is required). What result you may expect? 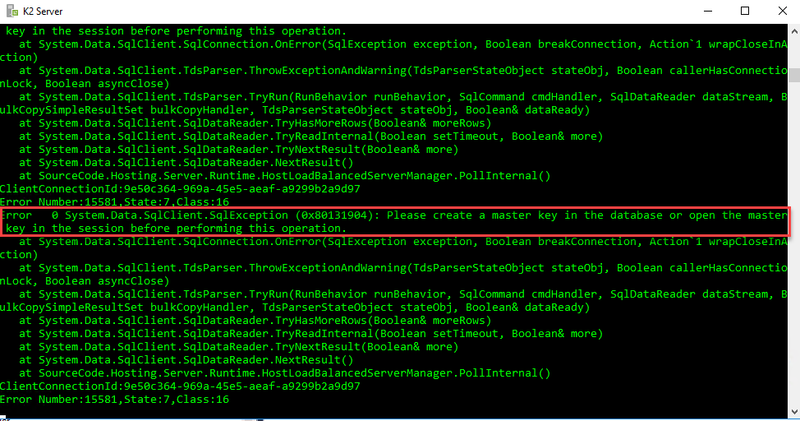 An error message which says System.Data.SqlClient.SqlException (0x80131904): Please create a master key in the session before performing this operation. Why is that? This is because we are unable to open Database Master Key (DMK) which is necessary to work with encrypted data in K2 database. 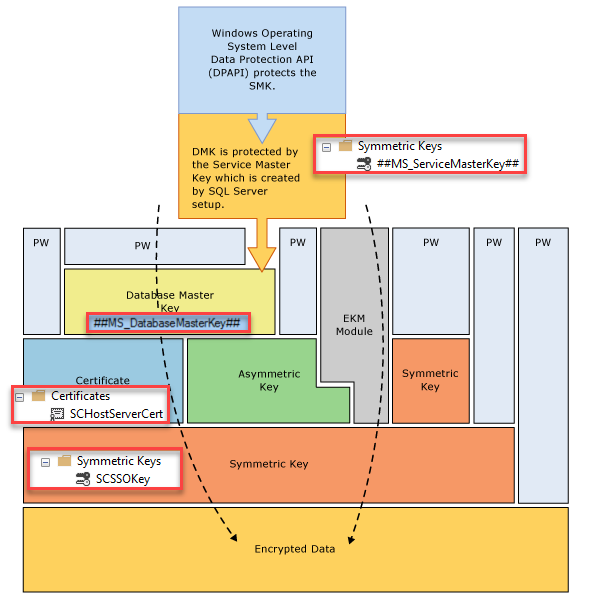 DMK is encrypted with use of Service Master Key (SMK) which is unique for each SQL Server instance and acts as a root of the SQL Server encryption hierarchy. 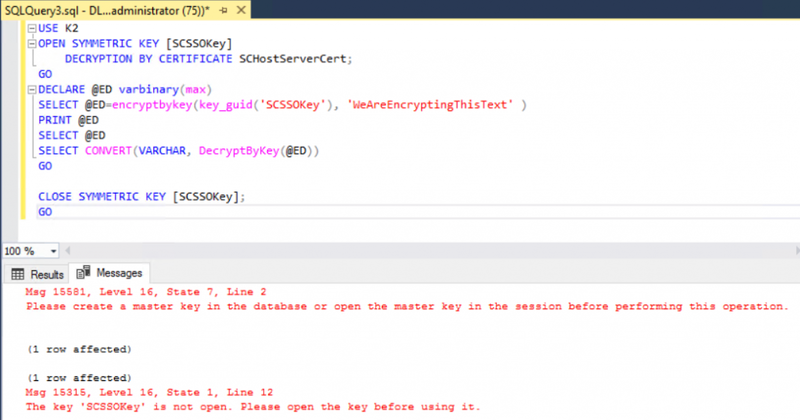 It means that by default, after migrating your K2 database to another SQL Server instance you are unable to perform encryption/decryption operations within it as you are unable to open DMK required for that. 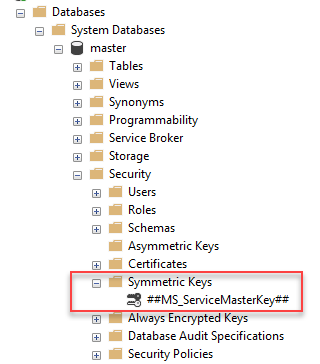 DMK lives within your K2 database (so you have it already), but you cannot open it since it is encrypted with SMK from your old SQL Server instance which is missing. DMK is used to encrypt certificate and asymmetric key, and those can be used to encrypt symmetric key which is the key which used for data encryption. Symmetric key being used for data encryption as using it is less resource intensive than use of certificate or asymmetric key, i.e. it gives you better performance. In any case, access to the start of encryption hierarchy is additionally protected by password. This is slightly modified image from Microsoft documentation – you can find original here. As you can see we just cannot perform encryption/decryption operations. And I hope you already clear on how we go about fixing this. Execution of this script will enable you to start K2 service, but you need to contact K2 support to get the password (unless you have it at your disposal already), and then run this script after database restore. This may be not desirable, especially when you need to involve different person/department for every action on SQL Server side. We can use different approach of copying and restoring instance SMK from an old SQL Server instance to the new one. This operation can be performed as a part of new SQL instance preparation process and has two obvious benefits: a) you don’t need to contact K2 support to get password and b) your restored K2 database is ready to use immediately after restore completion. 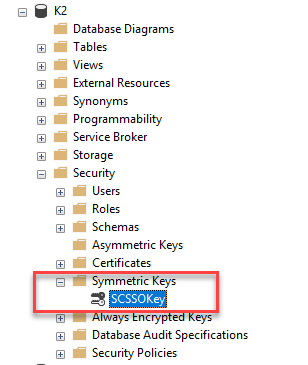 If you look at K2 documentation dedicated to configuration of SQL Server AlwaysOn you will see that main point there is that you need to copy SMK from your primary replica to all secondary replicas before adding databases otherwise you will have to use FORCE key to replace existing SMK and run the risk of potential data loss. If you perform these steps before restoring K2 database on new instance, database encryption will be working right off the bat and you won’t experience any issues with K2 service startup. Now if you combine this knowledge with using SQL Server alias in your environment you can migrate your K2 database to the different SQL Server instance with minimum downtime. 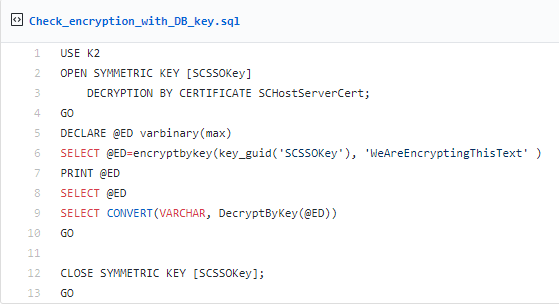 I hope this blog post was useful and informative and thank you for reading  Below you can find some additional links to learn more about SQL Server Encryption and configuration of SQL AlwaysOn for automated failover of the K2 Database. In case you have any questions or comments feel free to post them below.